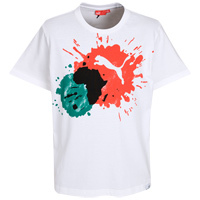 Official 2010-11 Puma Africa T-Shirt manufactured by Puma. Available sizes are S, M, L, XL, XXL. Brand new official t-shirt from Puma. To be worn in the 2010 African Nations Cup and the 2010 World Cup finals.